Dr. Shauna Hallmark is featured in a June 2, 2011, article in the Des Moines Register describing the effectiveness of automated, camera-based enforcement of red-light violations at specific signalized intersections in Iowa. 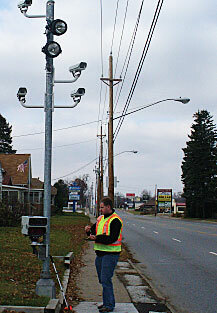 Through her research, Hallmark, director of the Midwest Transportation Consortium at InTrans and associate professor of civil, construction, and environmental engineering at ISU, has demonstrated that camera enforcement deters red-light running and reduces RLR-related crashes at the affected intersections. Read more.